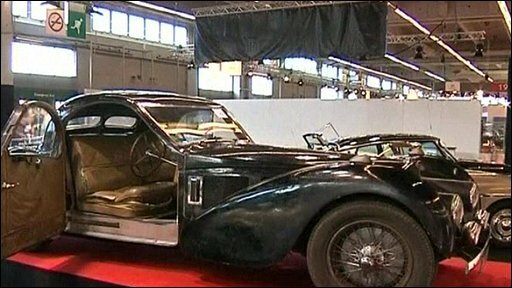 A classic Bugatti car, which gathered dust in a Tyneside garage for half a century, has been sold for 3.4m euros (£3m) at an auction in Paris. Bonhams had listed lot 17403 as a "motoring icon" with an engine that has not been fired up for 50 years. 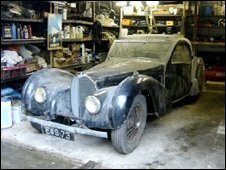 Relatives of reclusive Newcastle doctor Harold Carr found the 1937 Type 57S Atalante in a garage after he died. It was originally owned by Earl Howe - first president of the British Racing Drivers' Club. Just 17 were built. Bonhams tempted bidders by writing in its sales description: "The new owner will have the pleasure of firing up [engine] 26S and hearing that turbine-like sound that so excited Earl Howe when he collected this car from Sorel in 1937. "Once again [chassis] 57502, a true supercar with impeccable credentials, emerges to take its place on the world stage." Earl Howe took delivery of the sporty two-seat Atalante after it was completed in 1937 and kept the car for eight years. After Earl Howe sold it, it changed hands a couple of times before Dr Carr bought the car in 1955 from Lord Ridley, a member of the Northumberland gentry. Dr Carr drove it until 1960 when he parked it in his garage - to be discovered after he died in 2007. The car has a remarkably low mileage with an odometer reading of just 26,284. It eventually sold for 3,417,500 euros (£2,989,495). The Bugatti 57S is a highly coveted car by collectors, with at least four thought to belong to the Musee Nationale de L'Automobile in Mulhouse, France. Others remain in the hands of private collectors.